Microsystems are systems that integrate, on a chip or a package, one or more of many different categories of microdevices. As the past few decades were dominated by the development and rapid miniaturization of circuitry, the current and coming decades are witnessing a similar revolution in the miniaturization of sensors, actuators, and electronics; and communication, control and power devices. Applications ranging from biomedicine to warfare are driving rapid innovation and growth in the field, which is pushing this topic into graduate and undergraduate curricula in electrical, mechanical, and biomedical engineering. Professor G.K. Ananthasuresh is a Professor of Mechanical Engineering in the IISc, Bangalore, India. He has been working in the microsystems area since 1991 with emphasis on modeling and design. Prof. Ananthasuresh has edited the first book on Optimal Synthesis Methods for MEMS. Professor K.J. Vinoy (B.Tech., Kerala, 1991; M.Tech., Cochin, 1992; PhD, Pennsylvania State 2002) is an Associate Professor in the Department of Electrical Communication Engineering at the IISc, Bangalore. This is his third book in the area of Microsystems. Professor S. Gopalakrishnan is a Professor in the Department of Aerospace Engineering at IISc. He is a Fellow of INAE. Prof. Gopalakrishnan is the Chairman of the Aerospace Applications and Structural Health Monitoring group of the National Programme on Micro and Smart Systems. Professor K.N. Bhat was a professor at IIT Madras and is currently a Visiting Professor at IISc. He is a Fellow of the INAE. He has immensely contributed to the growth of VLSI and MEMS technology, Education and Manpower development in India. Professor V.K. Aatre was the Director General of DRDO and Scientific Adviser to the Defence Minister, Government of India. He is a Fellow of IEEE and INAE and is a recipient of the prestigious Padma Bhushan Award in India. He initiated two national programmes on Micro and Smart Systems founded the Institute of Smart Structures and Systems (ISSS). 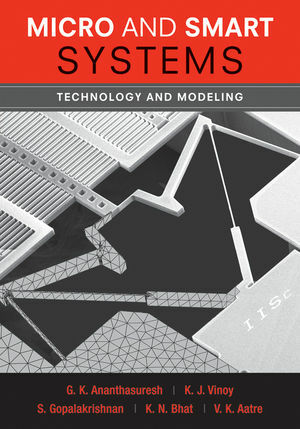 • The first self-contained textbook treatment of MEMS (microelectromechanical systems) written specifically for undergraduate course use with emphasis on modeling, both analytical and numerical. • Unified treatment of micro- and smart systems in terms of applications and modeling. • Written without assuming prior background in electrical or mechanical engineering but without shortchanging rigor. • The authors are all leading researchers in the field at a world-class research university. They hold Ph.D. degrees from Michigan, Penn State, Purdue, IIT Madras, and Waterloo, respectively. • The book is filled with current examples and applications from modern industrial practice. • Numerous solved examples, unsolved problems, and thought-provoking "your turn" teasers.